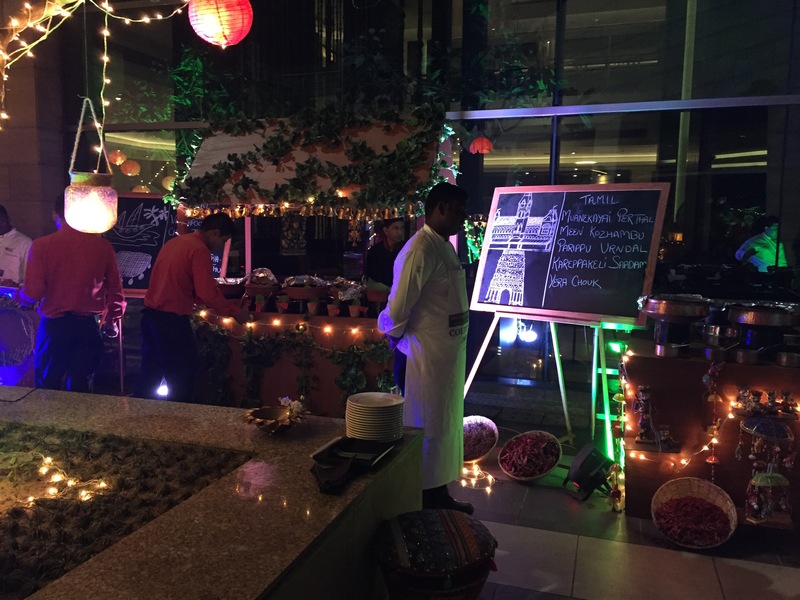 This was done to celebrate individuality, unity and the spirit of culinary excellence, the chefs showcased an elaborate range of dishes from across cultures and cuisines. 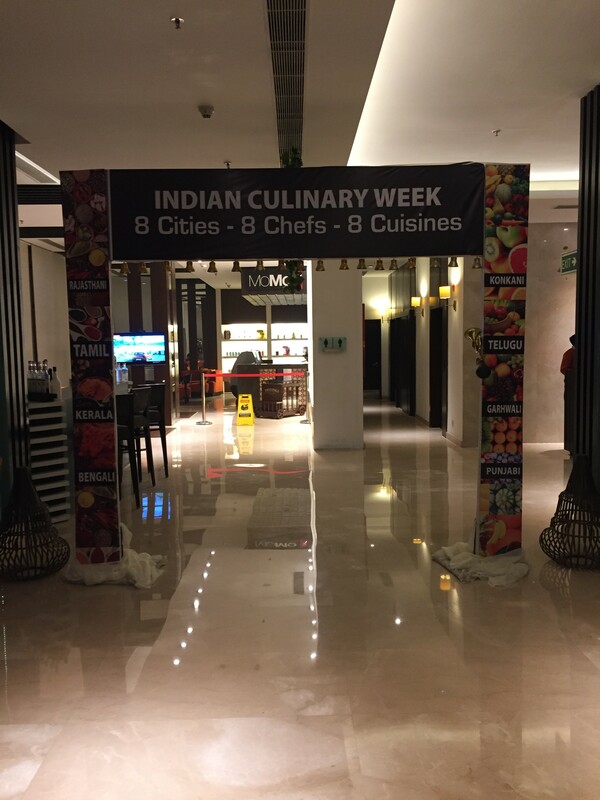 The festival served popular and rustic cuisines ranging from Konkani, Garwali, Andhra, Rajasthani, Tamil, Kerala, Bengali and Punjabi Cuisine. The Culinary stage saw the presence of Chef Thirumal from Bengaluru Marriott Whitefield, Chef Deepak Rana from JW Marriott Mussorie, Chef Ranjit from Jaipur Marriott Hotel, Chef Uday Karmalkar from Courtyard By Marriott Mumbai, Chef AmruthaValli from Hyderabad Marriott Hotel & Convention Centre, Chef Mithun Mohanan from Courtyard By Marriott Kochi, Chef Chiranjeet Mandal from Courtyard by Marriott Raipur and Chef Amarjeet Singh from Courtyard by Marriott Gurgaon presenting the best of their local cuisines. 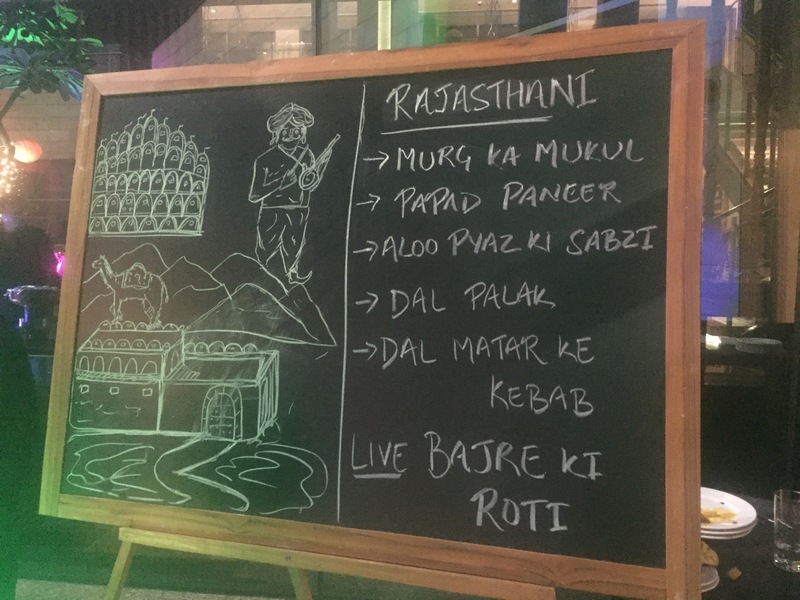 We started with Rajasthani cusine which was the first canopy. 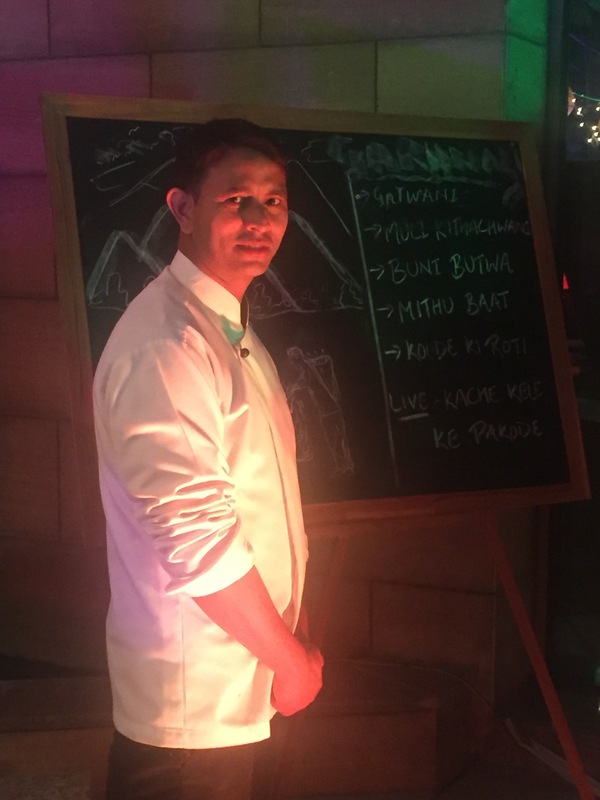 The black board on the side boasted of a menu with dishes made of chicken, paneer, aloo, dal etc so without much delay we grabbed the plate. 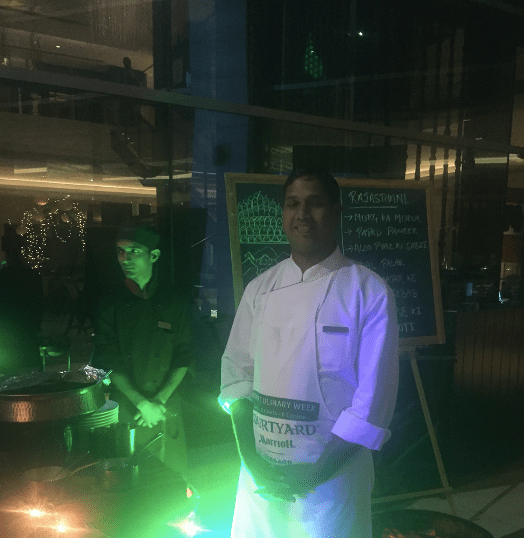 The first dish was Murg ka Mukul which comprised of Shredded chicken with a thick gravy made of bell pepper, onion and chilly. Absolutely delicious! Though, a little spicy but tasted well! Papad Paneer was soft and mushy paneer cooked with papad. Right flavour, not too spicy, and an absolute delight. Honestly, papad and paneer are two things which I absolutely love so my tastebuds really enjoyed this dish. Aloo Pyaaz ki sabzi was nice and had a great flavor. 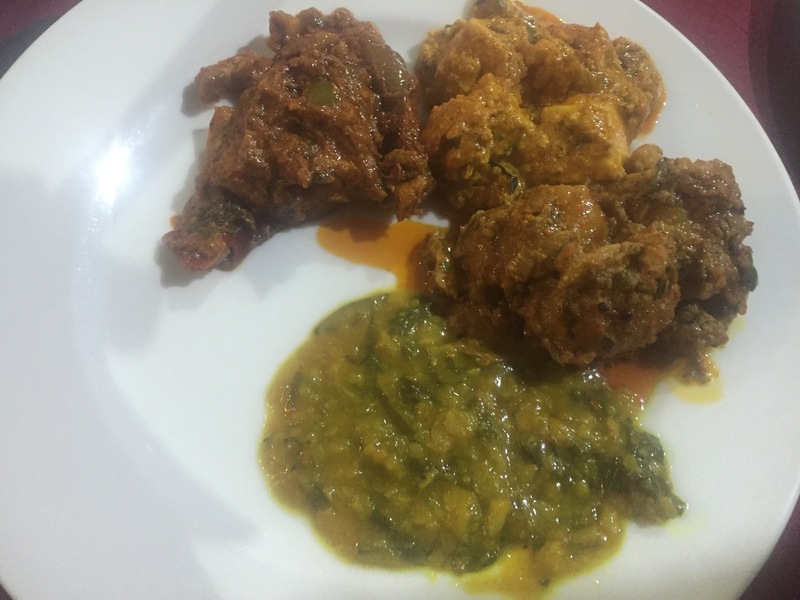 Dal Palak on the other hand gave a great homely taste. 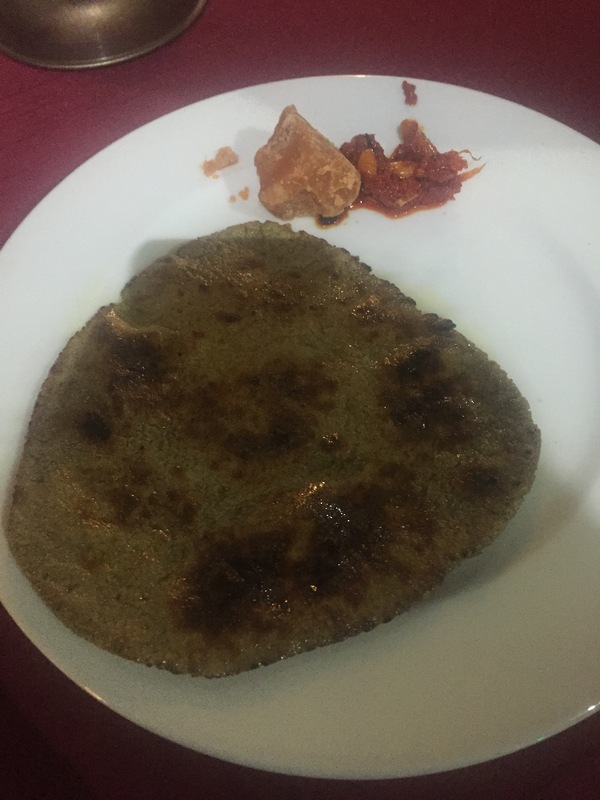 Bajre ki Roti was coated with ghee and served with gur (jaggery) and lahsun (garlic) pickle. It gave a divine flavor and we could just survive on it. Dal Matar ke Kabab was made with Moong dal, matar, green chilly, masalas and coated with papad. Visual delight, crispy and flavourful! 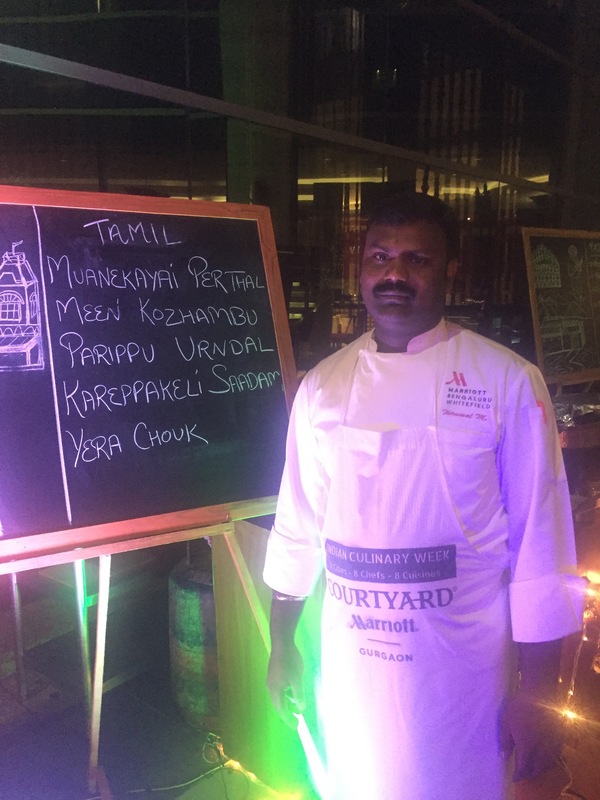 Tamil brought of really interesting mix of cuisines which we didn’t understand from the board but the chef came to our rescue who patiently explained us each dish in detail as we tried them. Muaneyaya Perthal was a Drumstick dish. Honestly, I have only had drumsticks only in sambhar so this was a different experience. Nice, not too spicy made with utmost love and care. Chopped onion and tomato along with ginger garlic paste, coconut paste, chilly powder, coriander powder, turmeric, mustard and curry leaves gave the right taste. Parippu Urandal was something like Dal Vada. Hard on the outside and soft and tender inside. 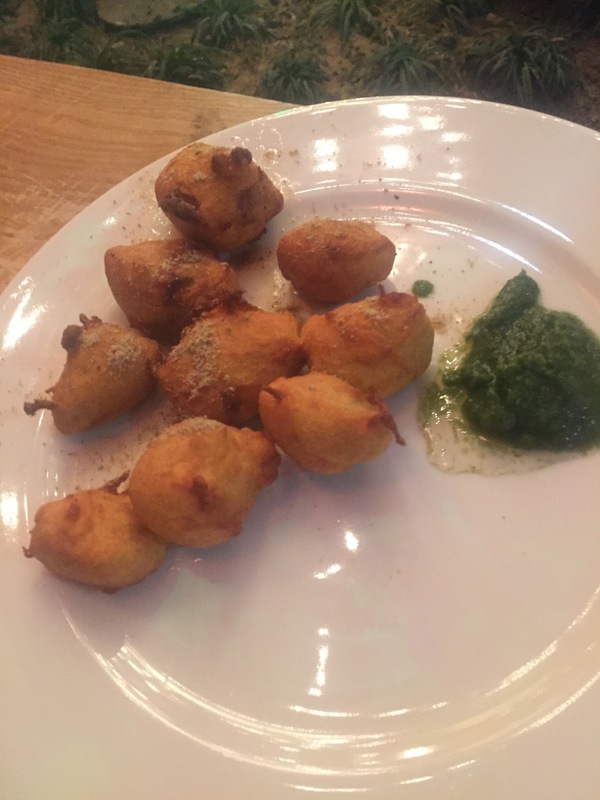 The chana dal flavor could be felt in the vada. Green chilli, curry leaf, ginger enhanced the flavor. Kareppa Keli Saadam was plain rice with powder made of curry powder, curry leaf, chana dal, jeera, black pepper and tempered with mustard cheese. Certainly an interesting fusion! Year Chauk, a Prawn dish was a little hard and crisp but delicious. 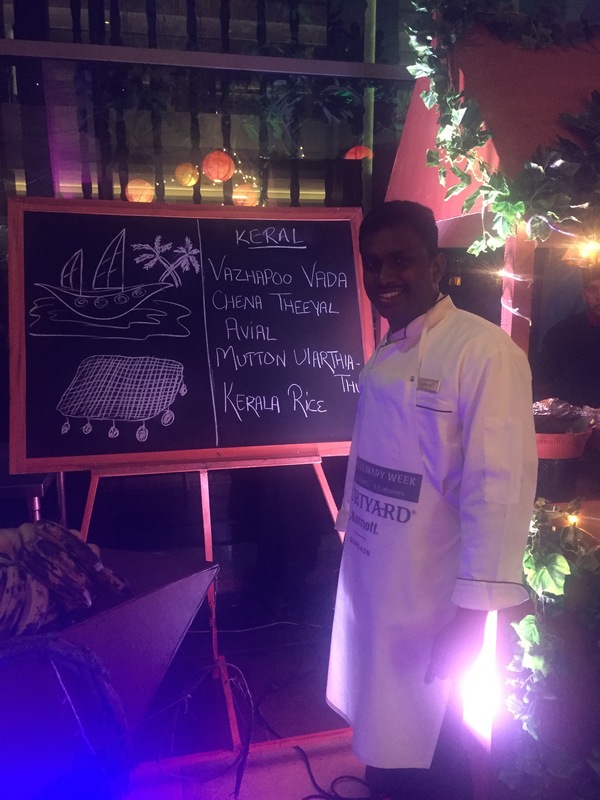 For Keral, the only things I understood from the board was Vada, mutton and rice but we could not resist trying out the exotic food on display. First came the Vazhapoo Vada. 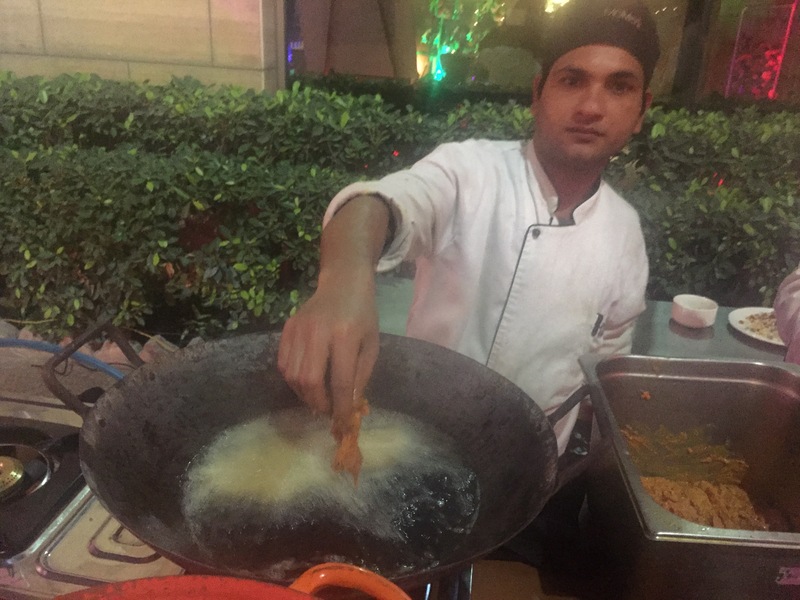 Vada is not alien for us Dilli wallas but this was something very different. 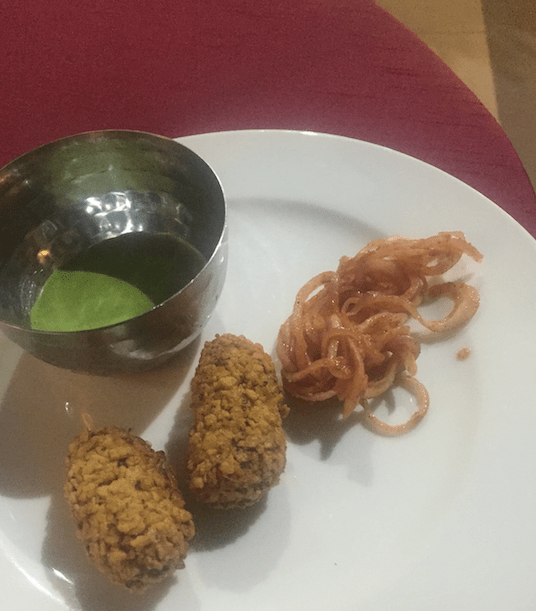 The dish was made of soaked yellow chana dal grinded with curry leaves, red chilly, jeera, fennel seeds, ginger, grated coconut and chopped onion…converted into tikkis and then fried. What impressed us was that it wasn’t too oily and flavourful at the same time. The chef’s recommendation was that the oil should be the right temperature for this. Chena Theeyal was Jimikand which I have never tried before. It had a distinct taste which was sweet and sour at the same time. Curious to know why? Jaggery and tamarind were added on the top. What an idea!! 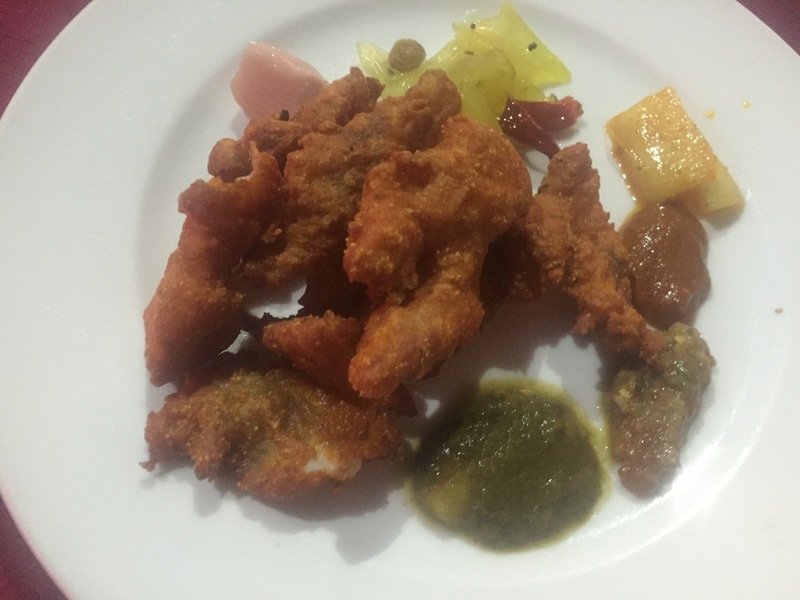 Avial was a Drumstick dish made with raw banana, carrot, beans, drumsticks which were strip cut and cooked with little water, turmeric, salt and curry leaves. 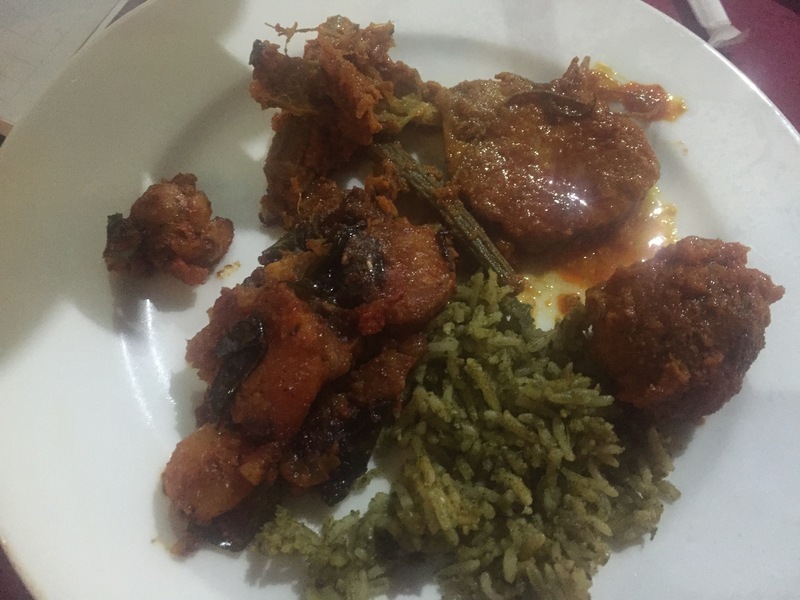 Mutton Ularthiathu was dry mutton sauté with onion, ginger, garlic and other spices. Quite different, lightly spiced, could feel the flavours. 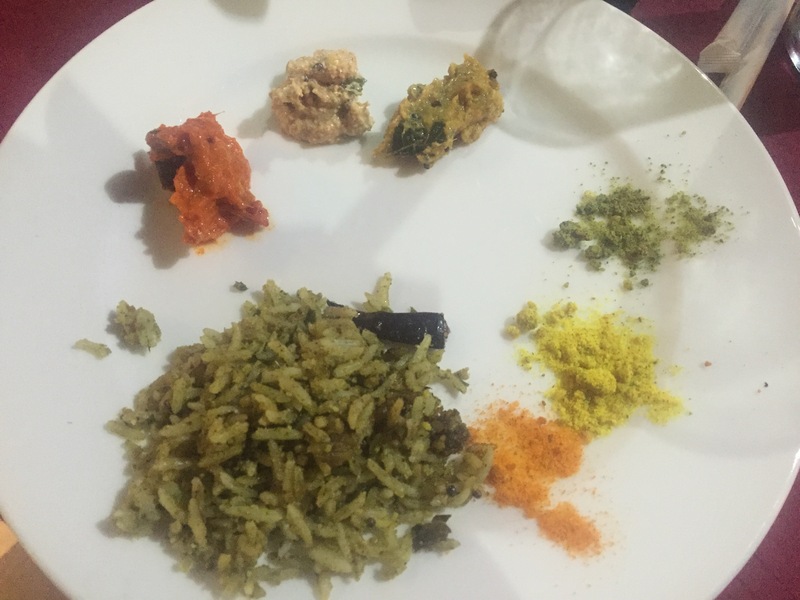 The Kerala Rice were bland made of Matta rice but tasted well with the assortment of dishes. What caught my attention were the colourful and flavourful chutneys known as Pachadi (accompanies). 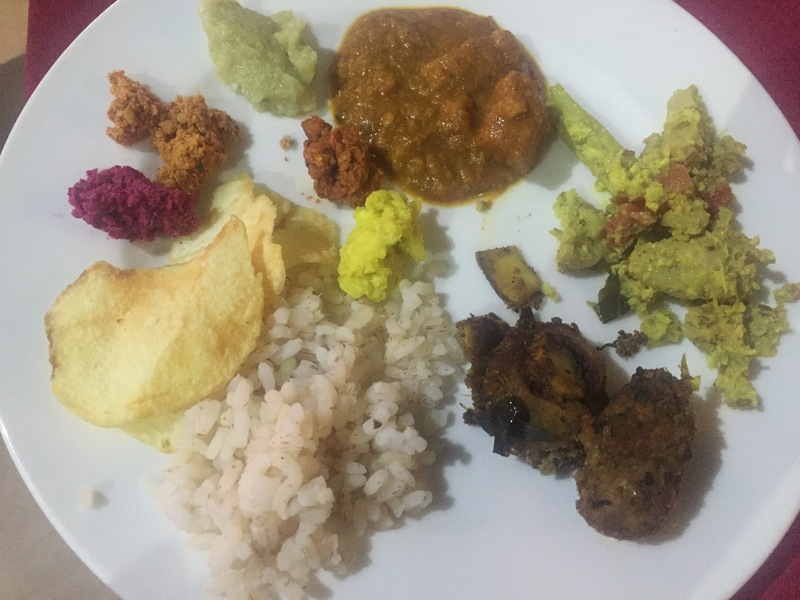 On offer was Beetroot, onion and raw mango, dry coconut, ginger (injaipuli) and pineapple. Next on our radar was Garwal and we could see the mountains and river on the blackboard along with a display of food for which the region is known for. 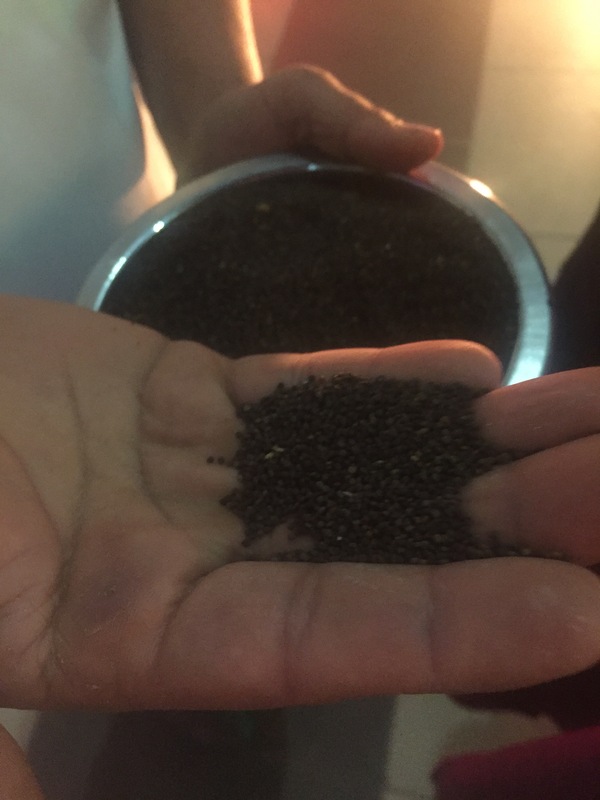 Gatwani was made from Dal found in the mountains. Warm and healthy! Gave a homely touch! As the name suggests, Muli Kitachwani was a radish dish with Jakhya ka tadka in a gravy of chopped onion and tomato. 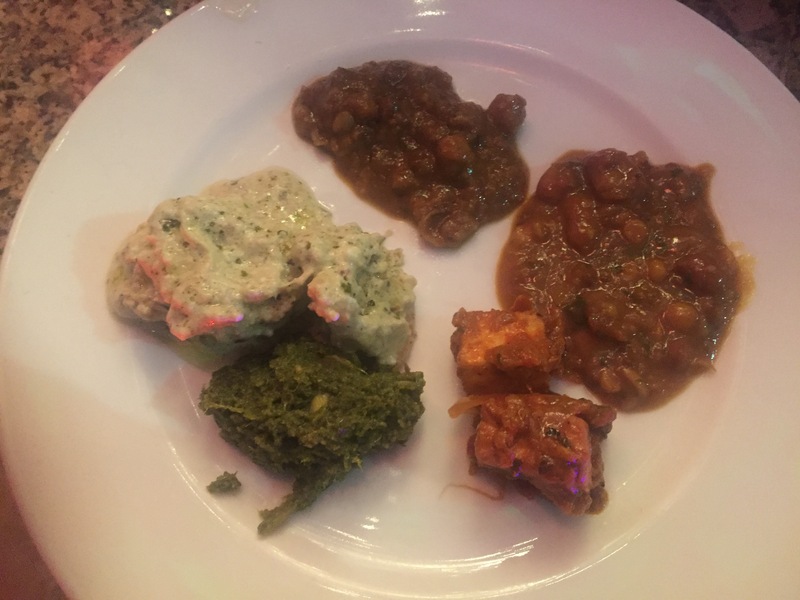 Quite innovative and nice…usually we are used to eat Mooli ke parathe but the dish did do justice to the vegetable. Buni Butwa was lamb lever. Healthy, nutritious and mildly spiced with haldi, dhaniya, lassan, jeera, sauté and laal mirch. 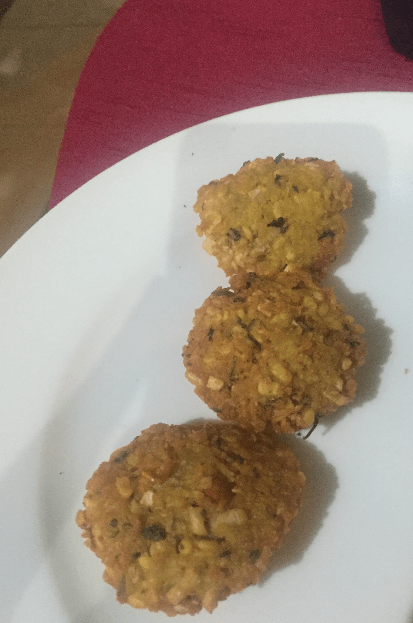 Mithu Baat was sweet and delicious and made with gur ka pani….absolutely delicious…could have had at any point of time…as a main dish or dessert!! 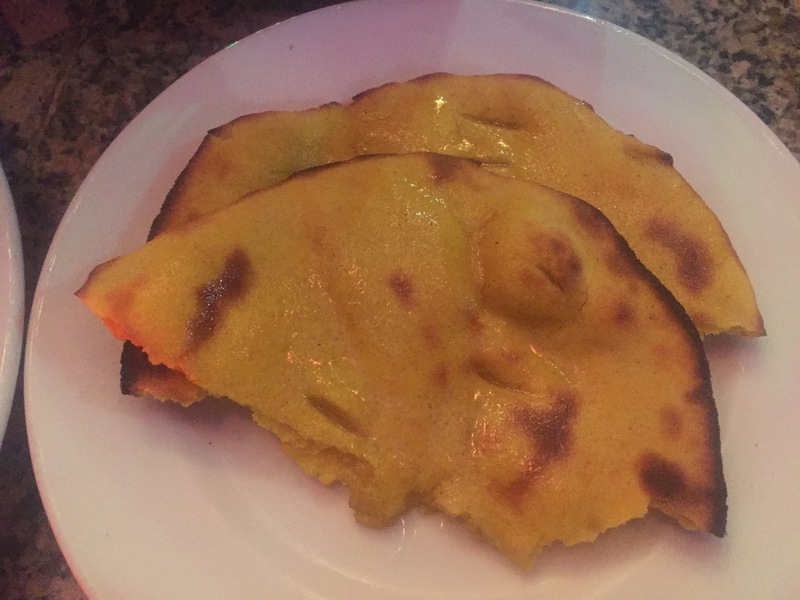 Koude ki Roti was crisp and nutritious. Koude is a seed which is a specialty of Garwal and is good for diabetes as well…so all you people who have been detected high sugar…u know what to eat now!! Kache kele ke pakode were nice, crispy yet moist at the same time. Now it was time for Jeete Da Dhaba, one of our favourite cuisines which is Punjabi, afterall, that’s what runs in our blood. Malai ka Kukkad looked like chicken made in cream and I was honestly suspicious of the taste but when I tried it I was absolutely awe struck. It was divine and simply amazing. Chicken cooked in ginger garlic, fresh cream, curd, cashew and desi ghee. 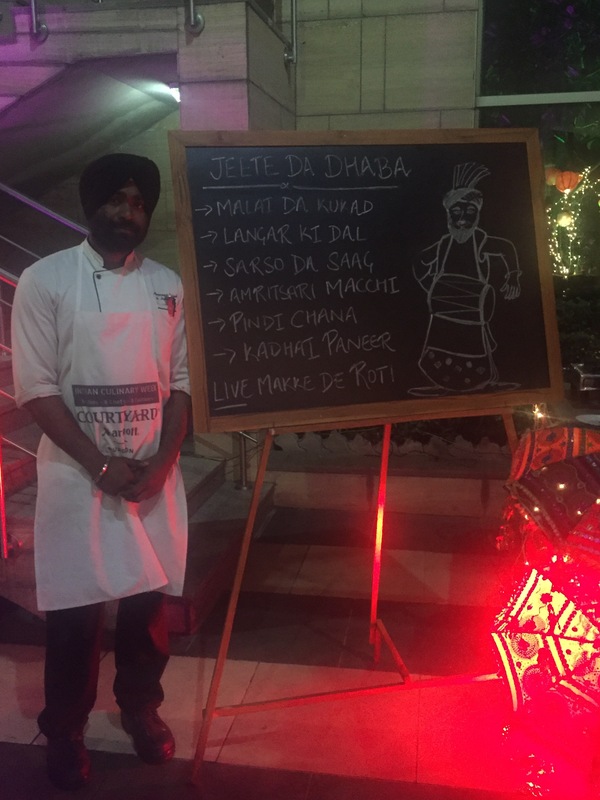 Langar Ki dal is what we have had a million times but the chef did add his own flavor in the dish. Ma ki dal along with chana dal and rajma were mildly spiced and gave a homely taste. Next was one of my favourite winter food- Sarso ka saag-makke ki roti….sarso ka saag was dry unlike what we usually have at our homes. It was actually the chef’s mother’s recipe and was tasty, blended well and nice. Makke ki roti was hot and soft and gave a great flavor with the saag. 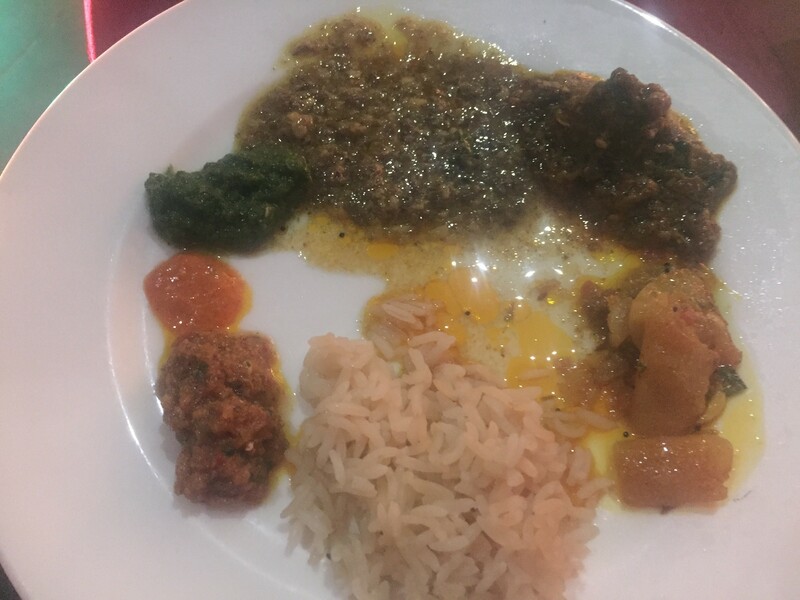 Amritsari Machi was crisp outside, soft inside and absolutely divine…what impressed me was that it wasn’t too oily. Yellow yolk along with salt, suji, rice flour, besan, ajwain and ginger garlic paste did the trick. Pindi Chana was mildly spiced and flavourful. We were curious about the black colour of the chana and when we got to know the reason, it was a pleasant surprise. 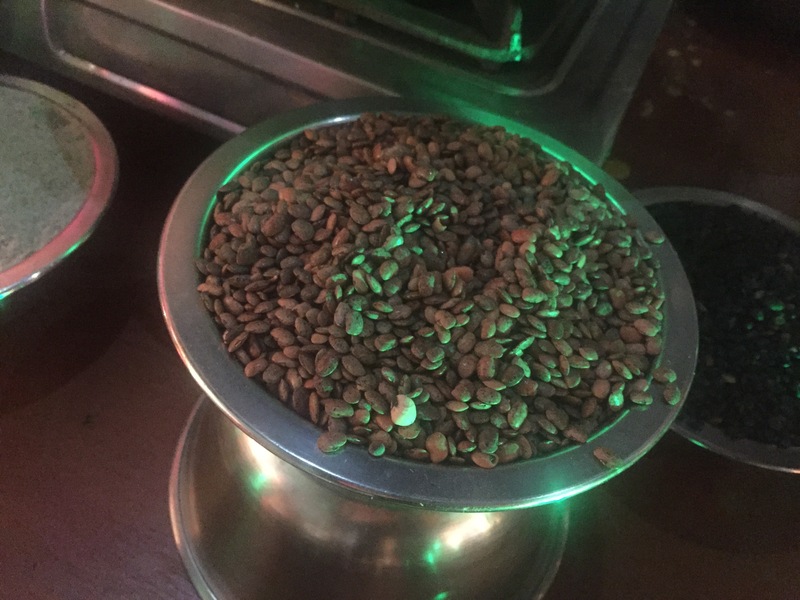 The chana was boiled in chai patti and obviously cooked with the right ingredients and spices. The Kadhai paneer was again mildly spiced along with chopped onion and tomato gravy and diced bell pepper. With a tadka of crushed black pepper, coriander and whole red chillies, it did impress my tastebuds. The chef does know his innovation really well. We wanted to try out more but realized it was already time for them to close the buffet. 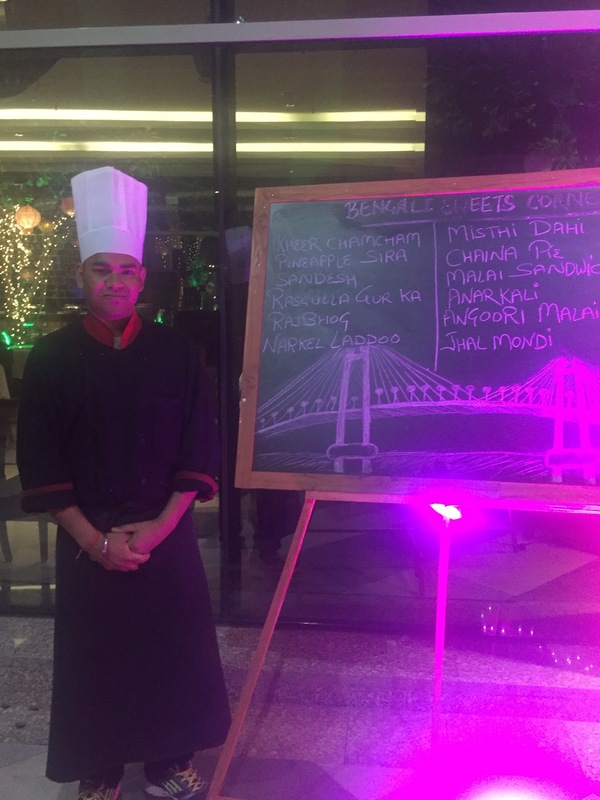 So without much ado, we headed towards Bengal to try the desserts made by the chef. Afterall Bengal is renowned for its Sandesh, Rogulla and Mishthi Doi. 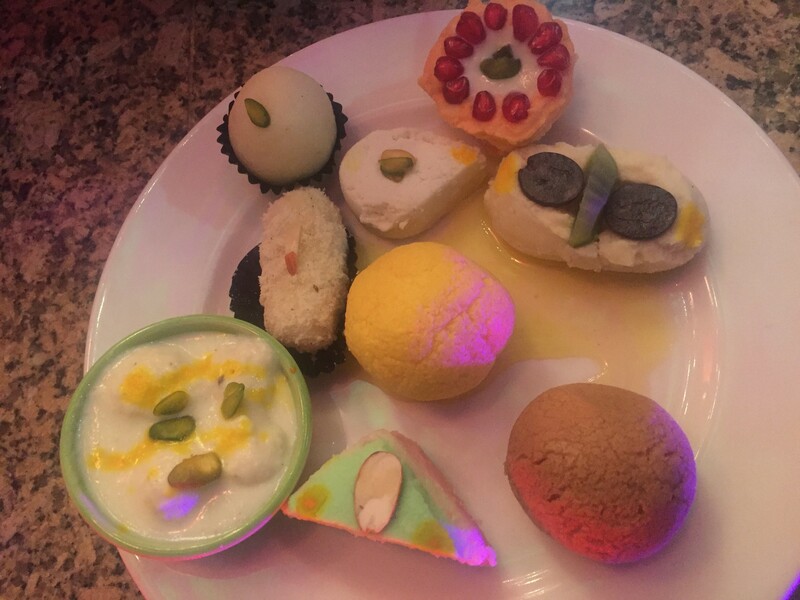 The array of desserts were nicely presented which made us crave for them even when we were full. We started with Gur ka Ragulla (brown) which was sweet and delicious. The Raj Bhog was stuffed with kesar, pista and elaichi powder and was refreshing and delectable. The Malai Sandwich made with cheena and khoya was colourful and tempting with its green, pink and white layers. The Kheer Chum Chum was divine. Sandesh which is a specialty of Bengal was nice and authentic. Not what we generally find in Delhi. The Angoori Malai Chaap had a nice angoori twist with khoya and cheena. 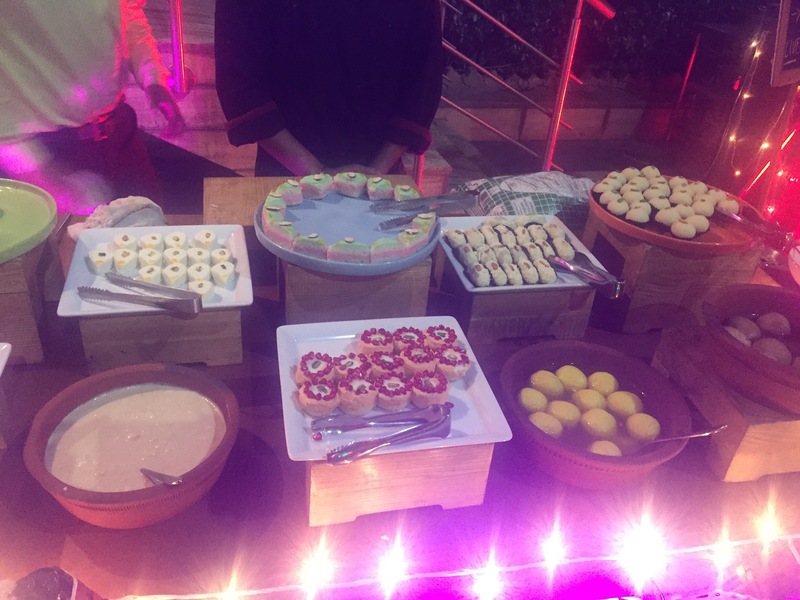 The Coconut Ladoo was delicious which was made along with khoya and milk, Anarkali was a personal favourite which made with cow milk, chena, cream with pomegranate on the top. Keep watching this space for more updates on fashion, lifestyle and food! !